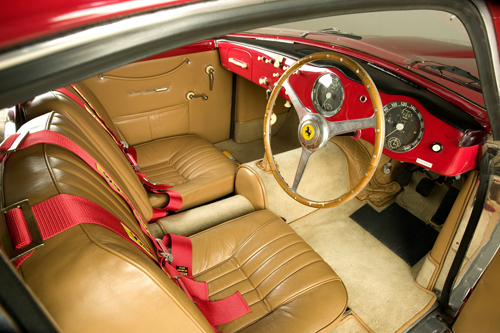 In the late fourties and early fifties, it was typical for Ferrari to sell their product as a rolling chassis and leave the customer to choose a Carrozzeria to produce the body and interior. This varied the image of the 212 Ferraris, with several cars having distinct bodywork. Most 212s featured elegant Vignale or Touring designs with a few unique examples having bodies by Ghia, Pinin Farina, Scaglietti, Stabilimenti Farina, Fontana and Motto, to mention just a few. And let's not forget Ghia-Aigle. Here is a story by Warren de France about a Ghia-Aigle bodied Ferrari 212. Warren's own car. The body of this strikingly beautiful 1951 Ferrari #0137 E was designed by Giovanni Michelotti as a freelance effort while still under contract to Sig. Alfredo Vignale of Carrozzeria Vignale fame. The official title of the car is a Ferrari Carrozzeria Ghia-Aigle. The Aigle label after the Ghia coachbuilders name refers to a Swiss based Carrozzeria. In the late 1940s Mr. Philippi of Aigle, Switzerland, owner of an automobile repair shop, visited Carrozzeria Ghia in Torino. He asked to use the name Ghia for his own coachbuilding business. The men in Torino agreed, sold him a license and hence Philippi's Ghia-Aigle coachworks were born. The French word Aigle means Eagle in English. The badge the Carrozzeria used was a brass plate with red, white and blue enamel, an eagle with wings spread and script Ghia-Aigle Lugano. 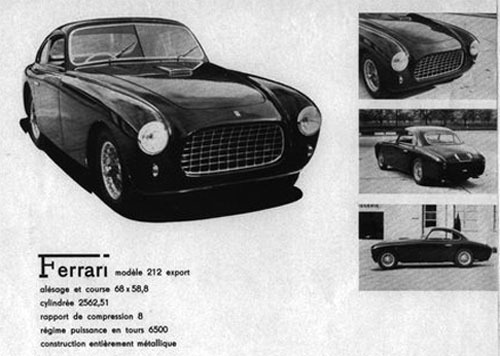 In 1951 Ghia-Aigle bodied two 212 Ferrari Exports, chassis numbers 0137 E and 0195 EL. Michelotti's drawings were transformed from pen and paper to coachwork by the respected Swiss firm of Carrozzeria Ghia-Aigle. The coachwork for #0137 is extremely unique and the only known example executed to this design. The engine was designed by Gioacchino Colombo. It had a bore of 68mm by 58.8mm giving a displacement of 2562cc. Two single overhead cam shafts, using a triple chain to drive the camshaft and rocker arms, finger followers and inclined valves make the engine design. The plugs sit on the inside of the engines vee. As was the practice at the time, the 212 series derived its type number from the total displacement of each cylinder in cubic centimeters. The exterior of the car was also rather competition in nature and notably void of superfluous chrome or aluminum trim. No bumpers were initially fitted at the front or rear, giving the car an overall and strikingly racy appearance. 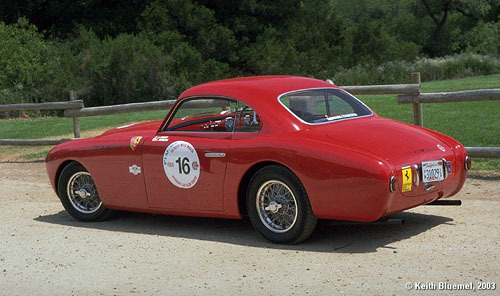 Chassis 0137EL was numbered to depart the Ferrari factory as a Type or "Tipo" 212 Inter, however the Carrozzeria Ghia-Aigle designed and built this car as a Tipo 212 Export. The car’s ID plate, although stating it is an Export, does not always convince some. Several noted experts including, Mr. Marcel Massini, Bill Noon and writer Stanley Nowak (Ferrari on the Road) agree the car is a 212 Export. 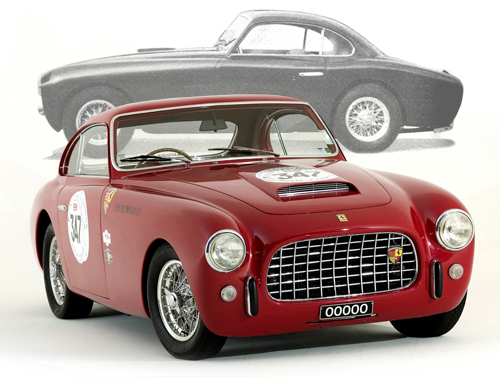 Cavallino magazine notes that #0137 has had some controversy over its correct designation, but stated in a previous issue that it is a real 1951 212-Export Lungo Berlinetta with a rare body by Ghia-Aigle of Switzerland. The Ghia-Aigle factory issued a sales brochure for chassis number 0137 in 1951, selling it as a Ferrari 212 Export by Ghia-Aigle. In early 1951, shortly after completion, the car was sold new to a Swiss resident, Mr. Thiebaud. The factory two piece windshield was updated early in the cars life to a single piece unit and bumpers were added front and rear. Chassis number 0137 E was later exported to the United Kingdom and registered on U.K. plates "EAM 212L". It was purchased (around 1975) and later offered for sale by the noted Ferrari enthusiast and connoisseur, Mr. Dan Margulies of London, England. The next custodian of this Ferrari was Mr. Buckland, who took the car to several shows and events. In 1985, 0137 E was exported from the U.K and imported into the United States. It was owned for several years by Mr. Robert Marceca and frequently seen at a variety of Ferrari Club Events throughout the 1980s and into the early 1990s. Mr. Mark McClintick, bought the car in 1992 and received a second in class for the National Concours in Grand Rapids the same year. In 1995, the car was sold by Symbolic Motor Car Company to Mr. Emile Yamano and imported into Japan. Mr. Yamano had the car carefully restored and prepared for vintage historic touring and racing events and has competed with the car in numerous venues over the years. Most notably, Mr. Yamano and his daughter raced the car in the Mille Miglia retrospective several times. In 1998 in was purchased by Yoshijuki Hayashi. The next year, 0137 E then became part of the growing Japanese Matsuda Museum Collection. The car was then sold to an American, Mr. Charles Arnott, who used the car regularly and entered it in the Mille Miglia and several other events, local and overseas. 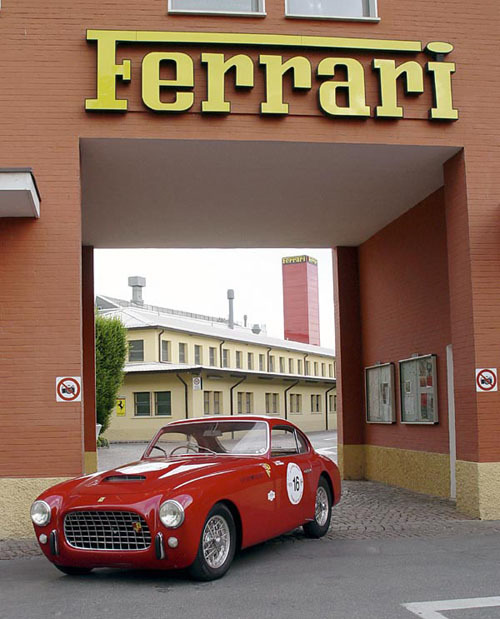 The custodian of this Ferrari changed in 2003, and was entered in the Mille Miglia retrospective again by Capt. W. de France (that's me), and invited to the Ferrari 60th in 2007. Getting into the car is akin to getting into one of the super cars. Or have the modern cars reverted to the 1950s? The steering wheel is located virtually above the front of the driver's seat. Instead of entering the car foot first, it is easier to enter head first and some how do a "triple lutz", which will plonk you in the exact position for driving. Typically, it was built for the macho Italian of the fifties. The painted metal dash holds several necessary instruments, namely a rev counter (with water temperature and oil pressure gauge) and speedometer (fuel and clock). The pull switches for ancillary items are of a white ceramic material. They are laid out in a systematic pattern, but then, if one does not drive the car every week, knowing what operates what, is by experimentation at first. All the knobs are the same, but a couple of minutes in the car will log the few switches in your memory. The gears are in a five speed pattern with first top left. Reverse requires you to push a button on top of the gear lever and locate the shift to the bottom right. Ferrari had a five speed box and a four speed box around the 1950's. First is of course non-synchronized, as is second, with third and fourth synchronized. Fifth gear is really an overdrive. Making second gear is difficult while the oil is cold so starting the day's drive from first to third is a normal routine here. There is plenty of torque available to cope with missing second gear. Third to fourth is a regular change, maybe a double declutch. Not really necessary but it feels good. Back down the gears is pretty much the same, with third to second requiring a double declutch and being much easier than going up the gears. Back to first and you need to stop the car. Driving around narrow and twisting roads, up and down the gearbox, is what this car was designed for. I believe I got more fun on this type of road in a 212, than if I was in a much more modern Ferrari. There is immense pleasure derived from the difference this car is to a more modern car. This is particularly noticeable when going from first to second without leaving some of the gears behind (hypothetically speaking, of course). It is a story here of practice makes perfect. The car draws you into itself, and the whole day becomes very pleasurable. However, it is not a car you would drive every day. More concentration is needed to drive these old classics than driving a modern car at same relative speed. But then again, is this not what it is all about? I am able to realize boyhood dreams, as this 212 is eligible for nearly every event conceivable including the Tour de France, Targa Florio, Mille Miglia, Colorado Grand, California Mille, Carrera Panamericana etc, etc. It certainly makes one think of all the possibilities that are available by owning such a car. Most would dearly like to do one of those events and I suppose all that has to be done for this lucky fellow is to make the time. The few cars that have survived this early period of manufacture are a tribute to Ferrari's history. Every classic vintage Ferrari seen today has some intriguing story associated with it. Click here for #0137EL's gallery. Visit Ghia-Aigle.info for more images and to see the other Ferrari models bodied by Ghia-Aigle.